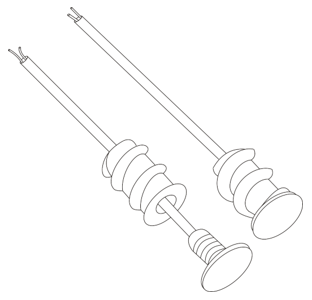 The CH-RTS3 is a two wire remote flush mount temperature sensor. It is designed for use with the CH-THSTAT-W and the CH-THSTAT-Z. The CH-RTS3 technical specifications, including the dimensions, wiring requirements, and installation instructions are found below. The CH-RTS3 sensor wires must be extended. Select one of the following methods. Twisted pair (22GA), with a max length of 250ft. Cat 3/5/6 cable (24GA) with a max length of 100ft for a single pair, or 200ft for a double pair. When connecting the sensor wires to the thermostat base select the RS1 or RS2 sensor contacts. The CH-RTS3 is designed for a flush mount in the wall or ceiling. Follow the instructions below for proper installation. 1. Drill a 1/2” pilot hole in the desired location. 2. Screw the self-threading remote sensor into the wall. 3. Press the temperature sensor into the wall mount.